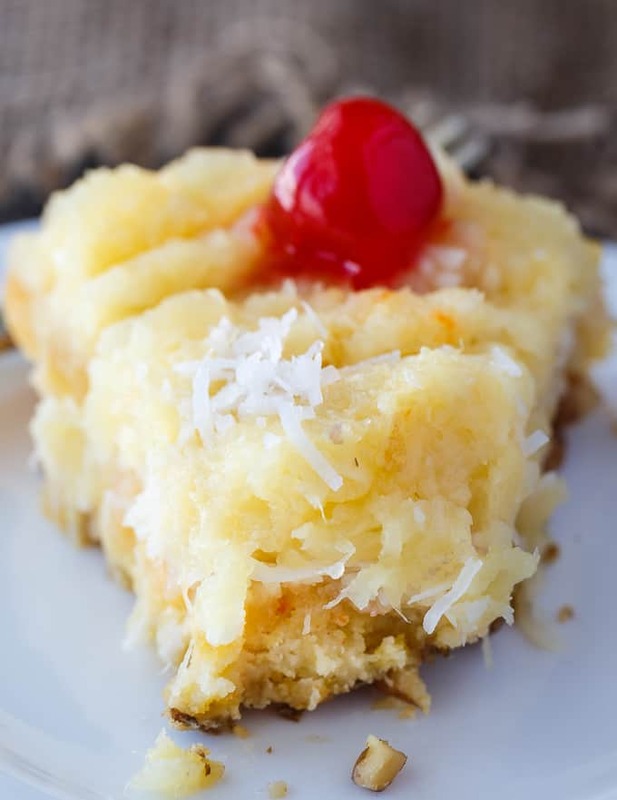 This cake is so easy and so delicious you’d be a fool not to make it! I love recipes with quirky names. I think it makes it more memorable. 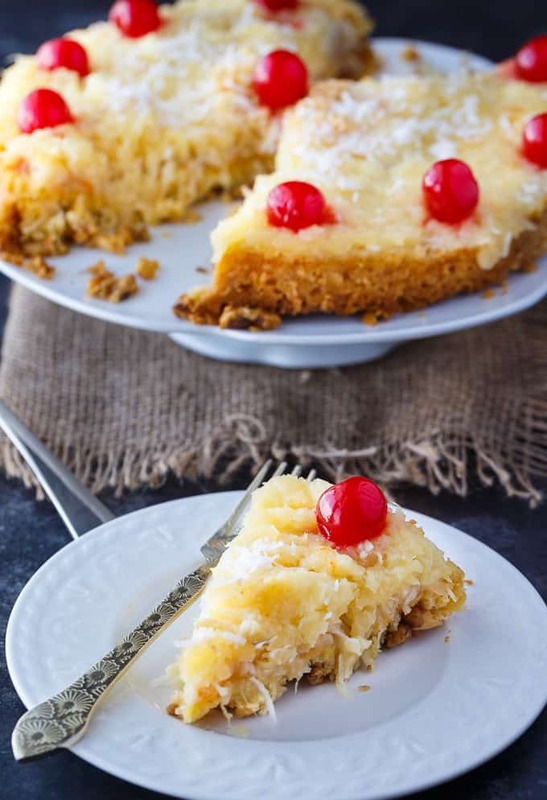 I think after you try this yummy Fool’s Cake you won’t easily forget it. The name makes me think of April Fool’s Day, but really you could serve it any time of year. I’ve brought it with me to potluck dinners and it’s always a hit. It uses a box of yellow cake mix making it a bit of a cake mix hack. I used yellow cake mix, but feel free to substitute another flavor if you don’t have that particular kind. To make a Fool’s Cake, you’ll need a few pantry staples. 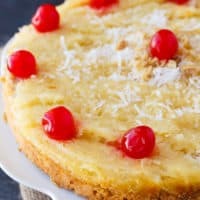 It uses a can of crushed pineapple, sweetened shredded coconut, a box of yellow cake mix, walnuts, butter and maraschino cherries. Not a fan of walnuts? Try pecans or simply leave out them out to make it nut-free. 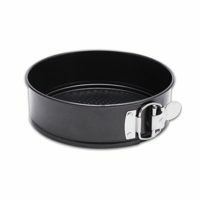 Grab a 9-inch springform pan and let’s get started! Spread the crushed pineapple with its juice on the bottom of the springform pan. Sprinkle on the sweetened shredded coconut. 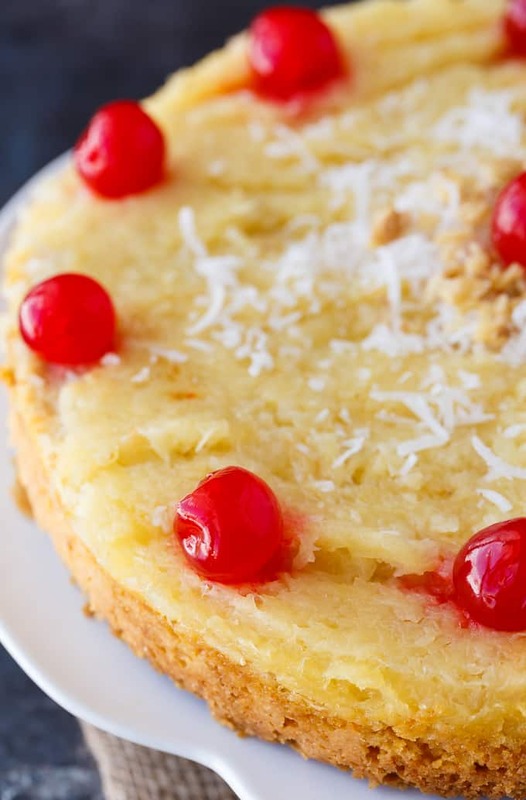 Spread the yellow cake mix on top of the coconut. Spread the walnuts on top of the cake mix. Dot with chunks of butter on top. Bake for 45 minutes at 350F. I recommend putting the springform pan on a baking sheet in case any of it leaks. Let the cake cool before you invert it on to your serving platter. Garnish with cherries and other leftover ingredients if you wish! 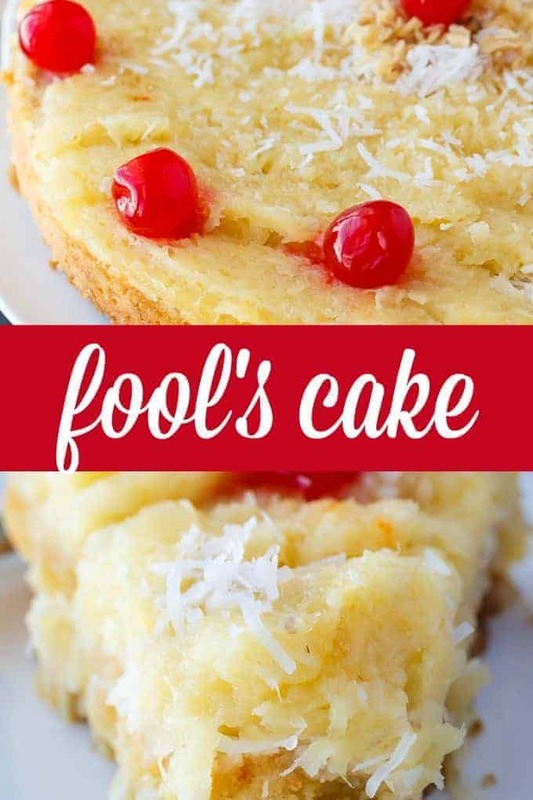 Fool’s Cake is a wonderful dessert to end a meal. Serve it when you have company over and want to whip up something quick to impress. It’s also great for potlucks when you are asked to bring a dessert. People gobble it up and it makes for a pretty presentation. I stored mine in the fridge for maximum freshness. It keeps for about three days. 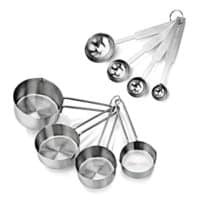 I have several more cake recipes you might enjoy! Oatmeal Cake – This incredibly moist vintage cake is covered in a sweet, buttery crunchy topping that is out of this world! Mayonnaise Cake – Super moist and delicious. Use mayonnaise instead of eggs in this yummy chocolate cake recipe. Hot Fudge Pudding Cake – o sinfully rich! Luscious chocolate cake bakes right with a creamy, chocolatey pudding sauce. Fruit Cocktail Cake – A super moist vintage cake that everyone loves! It’s so easy to make that it practically makes itself. Mocha Cake – This Mocha Cake recipe is wonderful served with coffee or tea. It’s moist and delicious with hints of chocolate and coffee flavours. 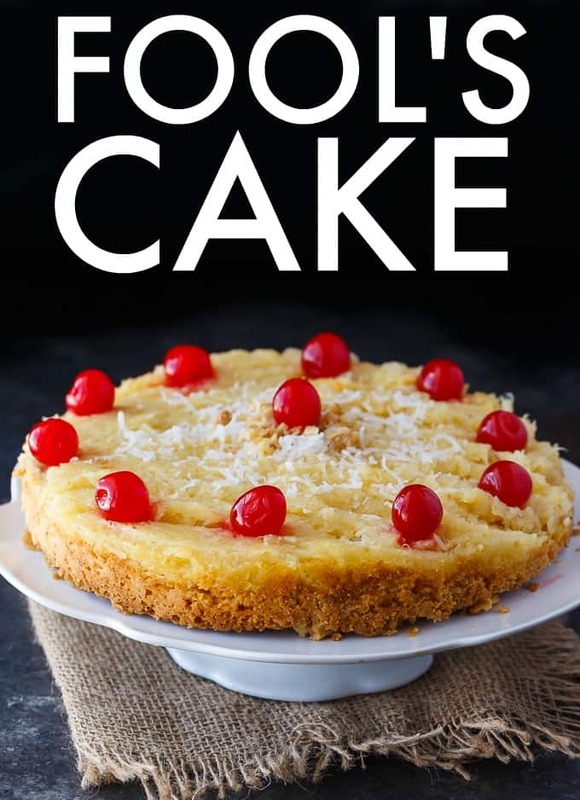 Are you looking forward to trying Fool’s Cake? A simple, fool-proof cake everyone loves! 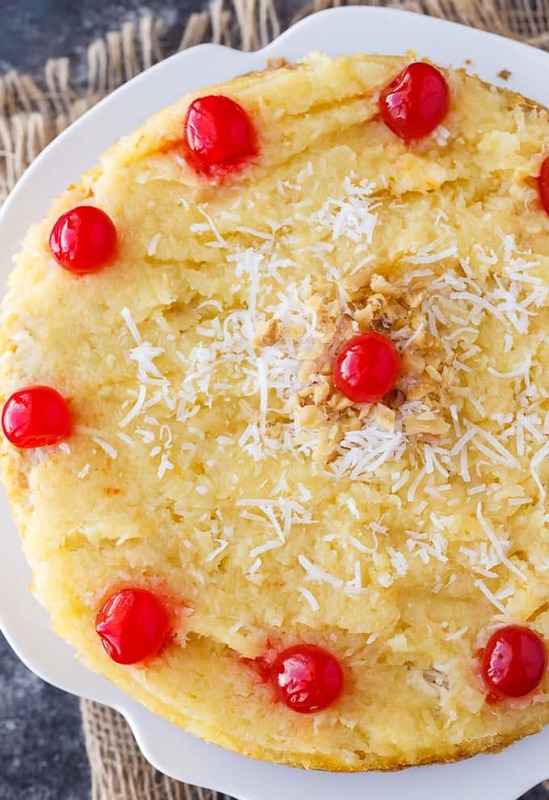 This yummy dessert has layers of walnuts, yellow cake, coconut and pineapple. Perfect for potlucks! Spread pineapple with juices on the bottom of a 9 inch springform pan. 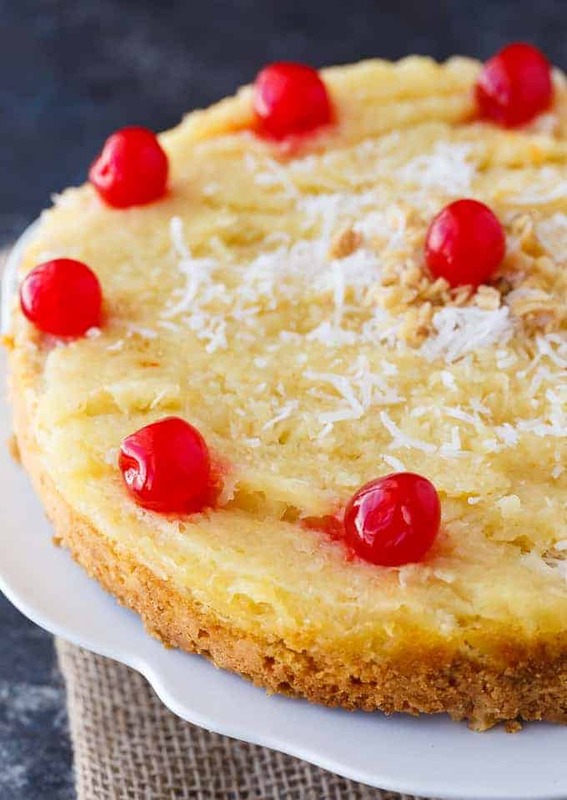 Spread yellow cake mix on top of coconut. Spread walnuts on top of cake mix. Bake for 45 minutes. Let cool before inverting on a platter. Garnish with cherries, if desired.